← Pet Stores and Puppy Mills – Don’t People Know Any Better? I absolutely despise the dog and cat meat trade more than any other animal cruelty issue on the face of the earth. It is a horrific, barbaric industry that unfortunately still thrives across Asia and Africa, a form of animal abuse that is so egregiously cruel, I am amazed that animal activists aren’t engaging in more boycott campaigns or live demonstrations than they already are, demanding an end a gruesome industry that has absolutely no place in our 21st century. This is the issue that horrified me enough to completely change the direction of my career and dedicate my writing to animal welfare. It inspired me to go from an armchair critic to an activist, from a carnivore to a vegetarian. And while there are many animal cruelty problems here and abroad that deserve ongoing attention and swift action, the pet meat trade is the one issue that upsets me far more than any other kind of abuse. So imagine how horrified I was to discover that technically, it is actually legal to slaughter and eat a companion animal in most states here in the U.S.! Yep, in the supposedly pet-loving U S of A, you can go into a shelter, pick out a dog or a cat, take it home, fatten it up, butcher and eat it in the privacy of your own home. Just don’t try to sell the meat – that’s against the law simply because the USDA doesn’t license or inspect the meat of companion animals. I was shocked. How could there not be tons of state laws, or even a federal law, to protect dogs and cats from becoming dinner? Last fall, Pennsylvania tried and failed to pass legislation that would have banned the raising, slaughtering or selling of dogs and cats for human consumption, but thanks to a statute included in the bill that prohibited pigeon shooting, NRA lobbyists succeeded in stopping its passage. So that’s it – two states that have decent laws, three states that sort of touch upon it and 45 states with nothing. Yes, all 50 states do have felony animal cruelty statutes, but most of them are unclear and porous, leaving plenty of wiggle room for pet-eaters to get away with their crimes, depending on how the laws are interpreted. But do any of our states actually have a big enough problem that would warrant stronger, more explicit legislation? After all, lawmakers aren’t going to go out of their way to enact any kind of law without some sort of need. Think Hawaii and you would never imagine that such a beautiful, tranquil place would harbor a very gruesome secret – its very own underground dog meat trade. Yep, thanks to a glaring loophole in the state’s anti-cruelty law, you can actually get away with eating a dog (or a cat) “if bred for human consumption” and killed “humanely.” As a result, a small percentage of Hawaii’s population has continued to satisfy its taste for dog meat, with few repercussions. All that could have changed with the passage of SB773, a bill reintroduced earlier this year by the Hawaii office of the Humane Society of the United States that would have closed that loophole for good and strengthened the state’s existing anti-cruelty law. But for the second year in a row, state legislators killed the HSUS-sponsored bill before it ever had a chance to reach the governor’s desk. Here’s what Inga Gibson, HSUS Hawaii senior state director, had to say about this very frustrating situation. For most people in the U.S., especially those of us who consider our pets family, the idea that our country would have any sort of issue with dog-eating is both shocking and upsetting. But as someone who grew up in Hawaii and worked in animal shelters and as a humane investigator for many years prior to her position at the HSUS, Gibson said she is all too familiar with Hawaii’s ongoing dog slaughter problem. Despite plenty of evidence to support the need for a stronger anti-slaughter law, Aloha State lawmakers have been historically resistant to doing anything about it. In fact, proposed legislation explicitly prohibiting the slaughter of dogs and cats has come before the state legislature for the last eight years, yet somehow never managed to gain enough traction to make it through the necessary hearings, she explained. As the most well-known victim of Hawaii’s dog meat trade, Caddy was an 8-month-old Lab/Shepherd mix who was stolen from the Moanalua Golf Club after his owner gained permission to leave him in an equipment shack while he golfed. Landscape workers at the club later pleaded guilty to stealing, slaughtering and eating the dog. While the men were charged with felony animal cruelty, both got off on probation. Still, thinking this case would send a strong message to the community about the consequences of engaging in this cruel practice, the HSUS hoped the problem would dissipate. But when Gibson continued to receive reports of dogs being slaughtered throughout Hawaii, the organization realized it was time to push for a stronger law. So in early 2014, they did just that, introducing SB2026, an anti-slaughter and trafficking bill that received overwhelming support from the community and passed unanimously all the way through its Senate and House committees. Until it died when the House failed to schedule it for a final hearing. 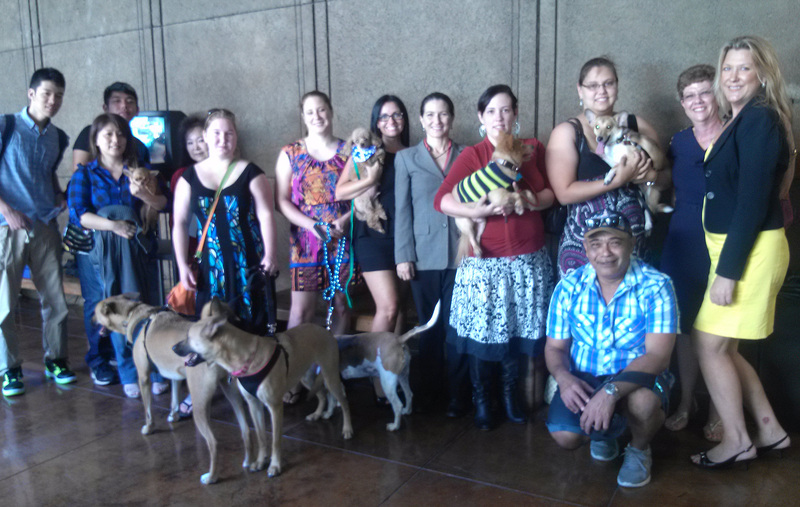 Dog owners and Inga Gibson (far right) gather at the Hawaii Capitol in support of 2014 Senate Bill 2026. While the majority of Hawaii residents abhor the practice of eating dogs, Gibson theorized that the small percentage of the population who are engaging in this practice aren’t doing it out of need but rather to satisfy a taste preference cultivated in their home countries. Besides the immense cruelty it inflicts, this illegal and unlicensed backyard industry also poses serious public health risks. Toxoplasmosis, e-Coli, cholera, trichinellosis, and other infectious parasitic, bacterial and zoonotic diseases can be transferred to humans when slaughtering, handling or even eating dogs or cats. 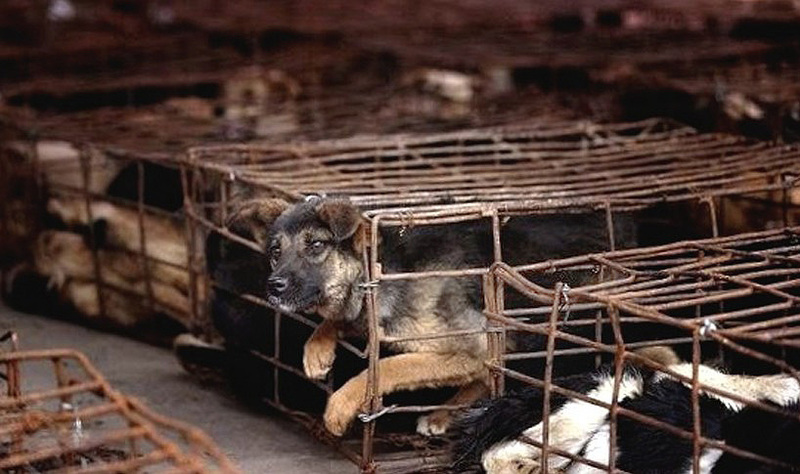 Rabies transmission through dog meat is the reason many Asian countries including the Philippines, Hong Kong, Laos, Cambodia and Thailand have long prohibited the trade, although enforcement remains an ongoing problem. 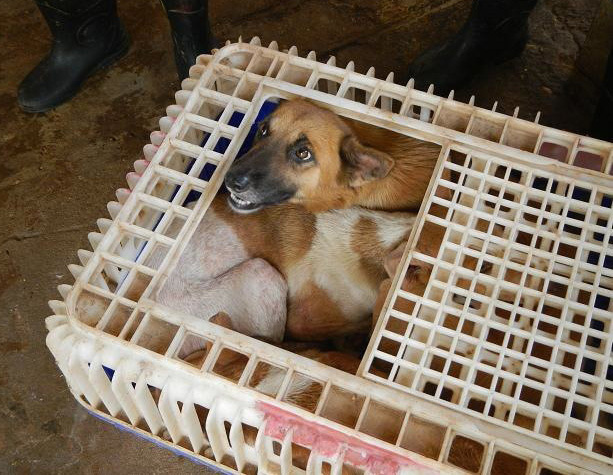 A rescued meat dog in Thailand stares up hopefully at its rescuers. Photo credit: Soy Dog Foundation. So while 48 states without strong anti-slaughter laws may not see a need to enact this kind of legislation, what’s Hawaii’s excuse? 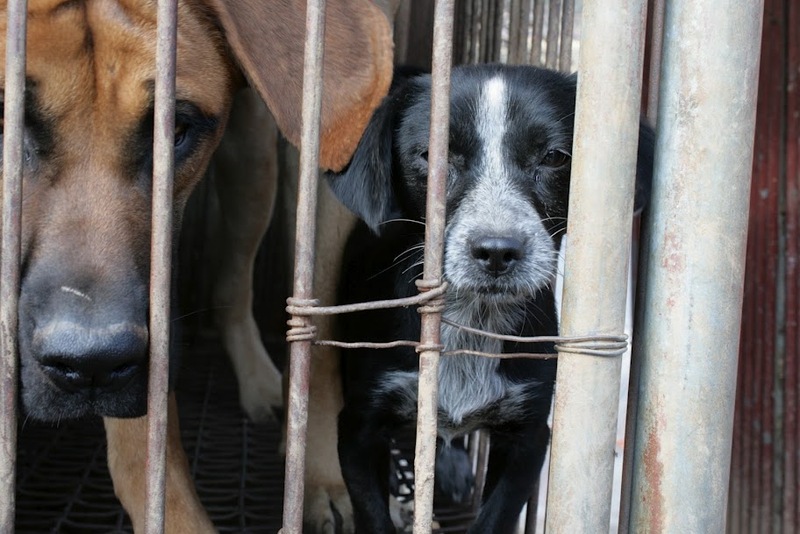 After all, this is a state where dogs are being stolen from people’s yards and sold to dog traders (evidently for $35 per dog) with customers waiting in the wings to purchase their “products.” It is even rumored that some restaurants actually serve dog meat if you know how to order it. How could Hawaii lawmakers not recognize the urgent need to protect their constituents’ pets? I love it when people try to make the “culture” argument to defend or justify animal cruelty. After all, human sacrifice and slavery were once part of our culture. So was binding women’s feet. Humans are supposed to evolve and change with the times, and the myriad cultures that inhabit the state of Hawaii should be no exception. We DO NOT eat dogs and cats in the United States of America, period. Culture is not a viable excuse! Curious about why he didn’t think this ongoing cruelty was significant enough to have supported SB773 and not just let it die (which he did), I tried contacting Hawaii Senate committee chairman Maui Senator Gil Keith-Agaran but he didn’t bother to respond to my repeated requests for comment. Despite two years of disappointment, Inga said the Hawaii HSUS remains undeterred and will reintroduce the bill again next year. So what can you do to help get behind the animal-loving citizens of Hawaii and finally get this much-needed bill passed into law? Contact Hawaii Governor David Ige and urge him to support anti-dog and cat slaughter legislation as well as stronger animal protection laws in his state. You can also follow this important issue by visiting the Hawaii HSUS Facebook page. While I love Hawaii and would love to visit, I certainly won’t be experiencing that “Aloha spirit”anytime soon – I do not spend my tourist dollars in places that support the dog and cat meat trade. So that means that besides Hawaii, I won’t be traveling to China, South Korea, Vietnam, Laos, Cambodia or Indonesia, either, to name just a few places that condone this abhorrent practice. That’s fine. I’d rather go back to Europe, anyway. This entry was tagged animal cruelty, animal welfare, dog meat, HSUS, meat trade. Bookmark the permalink. Scuse me while I wipe the tears from my eyes and the rage from my heart! This situation is indefensible!! Perhaps we could get the emails or phone numbers of the relevant officials in Hawaii and contact them…I have a wonderful cousin in Maui I will send this story on to….my mother lived on Hawaii for 25 years and never knew anything about this outrageous practice….thought it was going on only in the Far East…. Thank you for investigating this practice and sharing the information….if each one of us did ONE thing toward fighting back, we might make some inroads ….